Searching for Yorkies for sale? Look no further than Petland, your local, family-owned pet store! 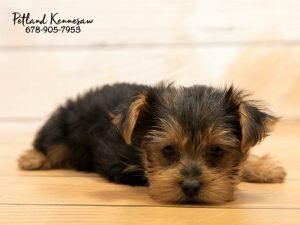 Yorkshire Terriers are easily one of the most recognizable breeds in the dog world. With their precious little teddy bear faces and loving disposition, the Yorkie is a perfect companion for many different types of families. The Yorkie is loyal, playful and despite their small stature, will protect their families at all costs! Want to learn more about the Yorkshire Terrier? Read along below for information on this tenacious breed! Can’t wait to see picture of the Yorkies for sale in our store? No problem, just click here for our available puppies page! Yorkie puppies are really the absolute cutest! Again, the Yorkie is a very recognizable breed in the dog world. They only come in black and tan, blue and tan and the very rare chocolate and tan. However, all Yorkies will turn a shade of silver and tan within the first few years. They are a very small breed, averaging just 4-9lbs full grown. They also have a very long lifespan at just around 13-15 years. Because they technically have hair instead of fur, they do not shed as much as other breeds and have been known as a good fit for those with allergies. Because their haircoats continue to grow, we suggest finding a good, local groomer to take your puppy to if you don’t want to groom them yourself. Yorkies are well known for their vivacious personalities! They certainly don’t realize how small they are and will fearlessly jump into any situation. You definitely have to keep an eye on them as they are prone to getting into anything and everything because of their curious personalities. Caring for very small breed puppies is a lot of responsibility, you must be there making sure they eat enough, have plenty of rest and don’t get into anything that could be dangerous. Yorkies are very intelligent, which is good for training, but you must have a firm hand with them! And we suggest lots of treats too! Interested in finding out more about our Yorkies for sale? Just give our knowledgeable Pet Counselors a call today and they can help with any questions or concerns! If you think the Yorkshire Terrier could be the perfect breed for you, swing by the store today to all of our adorable puppies in person.